I got this text from my sister yesterday. I have a very complicated relationship with my dad and always have. He does not call me and I only called him on Thanksgiving and Christmas, maybe an occasional Father’s Day. When my last phone became useless I lost all the numbers on it so now I only talk to him when I travel to New Mexico to visit my mom and my sister. It’s the visit we put off until the night before I leave, he takes us out to dinner and we might sit around a chat for a bit. I am always so grateful for the distraction that my own family provides. My oldest shows off whatever new gadget she has, her digital camera or iPod, my son makes silly faces or tries to tell my dad something random all while my littlest hides behind me. I think the whole atmosphere makes her on edge. The news brings up so many feelings, worry – is this the hospital that he won’t come out of? Sadness because he’s been the only father I’ve had since I was around 3 years old and we’ve never really meshed. Guilt because I can’t be there and deep down there is maybe a small part of me that feels a tiny bit relieved. If I cry am I being over-dramatic? He is doing better today so it all becomes a moot point, until the next time he goes into the hospital. 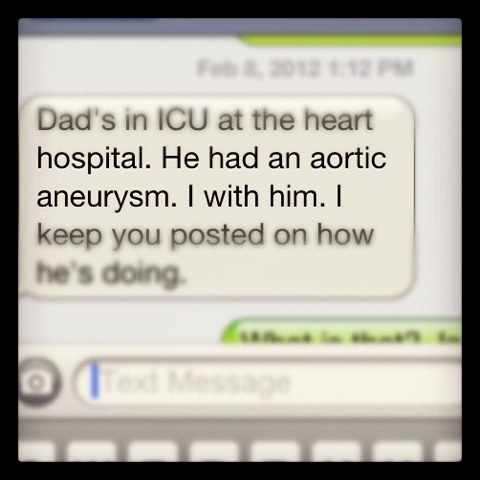 This entry was posted in Growing Up, Instagram, Project 366 and tagged aortic aneurysm, dad, guilt, heart, Instagram, project 366, relationship, text. Bookmark the permalink. Sorry to hear, the relationship I have with my own father would be categorized as interesting. More on his side as I am known to talk too much.